Two six-story residential apartment buildings which will be located steps to the Alewife MBTA station. 320 apartments will be constructed across both buildings including studios and 1, 2 and 3-bedrooms. Resident amenities will include a fitness center, a pool, a yoga studio, resident lounges, a theater room, and bicycle storage and maintenance space. 243 vehicle parking spaces will be located both underground and at ground level; 336 long-term bicycle spaces and 38 short term bicycle spaces will also be provided. Zipcars will be located on site. Two existing buildings on site, the Lanes and Games bowling alley, and Cambridge Gateway Inn motel will be demolished. 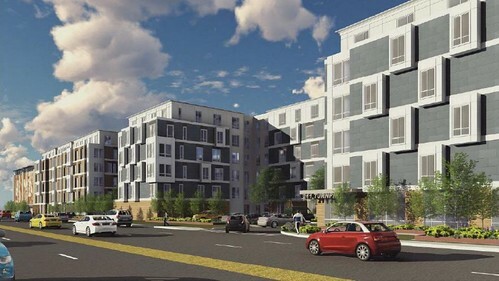 The City of Cambridge's Planning Board has approved The Residences at Alewife Station, a 320-unit apartment development that will replace the Lanes and Games bowling alley and Cambridge Gateway Inn motel along Route 2 in West Cambridge. Lanes and Games will remain open through this summer, after which construction of the development is anticipated to commence. Criterion Development Partners has unveiled the latest renderings of the proposed 320-unit Residences at Alewife Station development in Cambridge. The development would replace the existing Lanes and Games bowling alley and Cambridge Gateway Inn motel. The latest renderings of the proposed development, as well as the latest project details, can be found above. The following is a link to a recent community meeting presentation with more information about the proposed development. Criterion Development Partners has filed a Notice of Intent (NOI) with the City of Cambridge to construct The Residences at Alewife Station, two new residential apartment buildings located steps to the Alewife MBTA station. 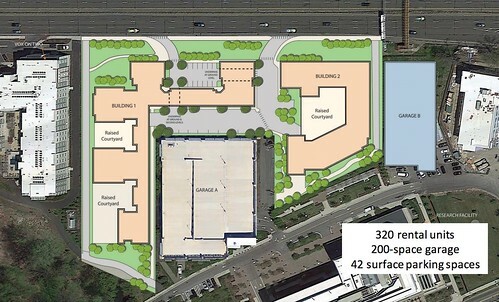 The buildings would be constructed on the site of the existing Lanes and Games bowling alley and Cambridge Gateway Inn motel, both of which would be demolished. The following is a link to the NOI application for The Residences at Alewife Station; a preliminary site plan can be found above. This page will be updated with additional information as it becomes available.